Madaba and Mount Nebo are close in proximity to each other and are both sites of religious importance. According to the Bible, Mount Nebo is where Moses first viewed the Promised Land, an area God gave to the Israelites. I was moved by its Biblical significance, and in Madaba I marveled at the complexity of mosaics, which depict the Holy Land. How to get there Madaba is a quick 30-minute ride southwest from Amman. Rows of olive trees in shades of green spread out from the King’s Highway and roll across the distant hills. 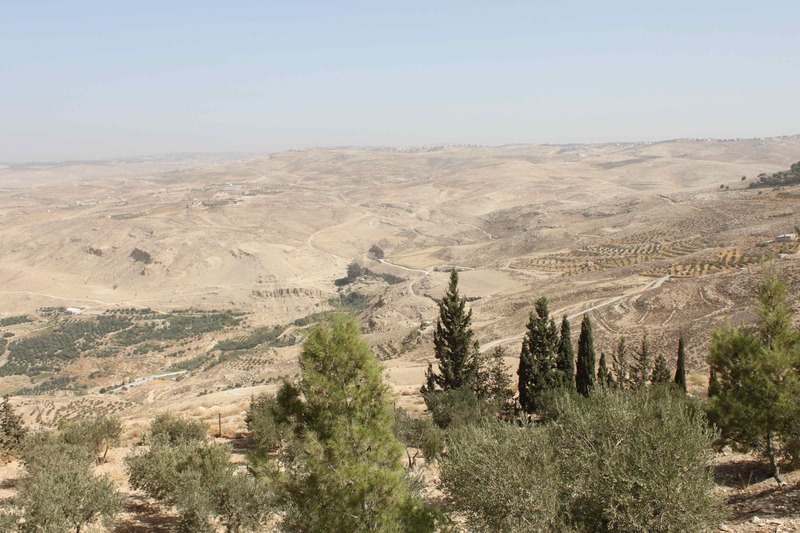 Mount Nebo is a short ten minutes from Madaba, which makes these two sites a great day trip. JETT runs a bus service on Thursday and Friday to Madaba. Buses leave at 8 a.m. from Amman and return at 3 p.m. Round trip is about $40. A taxi should be around $20. Discuss rates before accepting a ride. What to do Madaba is a charming city in central Jordan with an equal population of Christians and Muslims–very unique to find. The city has many narrow, inviting streets to explore and tiny shops with welcoming locals selling local fares. 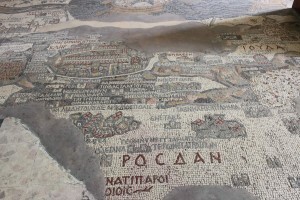 Madaba is best known for its mosaics and is home to the iconic 6th century Byzantine-era “Madaba Map”. This large map, originally measuring 25 by 5 meters, was discovered in 1896 on the floor of the Greek Orthodox Basilica of St George’s. The intricate tiles illustrate The Holy Land and Jerusalem. I was impressed by the time it must have taken to accomplish a work of art with such fine detail, vibrant colors, and perfectly symmetrical tiny squares. The church is open daily from 8 a.m. to 6 p.m., except Friday when it opens at 9:30 am and Sunday at 10:30am. There is no charge for entering or viewing the mosaic. The Madaba Archaeological M useum houses many notable mosaics, displays of glass from influential periods including the Hellenistic and Roman, and a compilation of interesting pottery. Open in the winter from 8 am to 4 pm, and in the summer from 8 am to 6:30pm. Entrance fee is around $3. Lunch Time Haret Jdoudna is a truly unique dining experience because the restaurant was resurrected from a Late Ottoman house. Walking through the bridged doorway, you feel as though you are stepping back in time. In nice weather, a rooftop eating area provides beautiful sunsets. Hungry travelers can enjoy traditional Arabic-style barbecue, which is my favorite, as well as Lebanese and Italian dishes. Three course meals are $20-$40. Located on the town’s main street, Talal Street. What to see at Mount Nebo I visited Mount Nebo on a very clear Thursday afternoon and enjoyed a magnificent panoramic view of the Holy Land and surrounding areas. I was thrilled by my random luck. My friend pointed out Jerusalem and Jericho in the distance. Both Christian and Jewish traditions believe Moses died here and was buried by God Himself. Growing up in a Christian home and learning these stories in Sunday school, it was a very meaningful experience to be standing in places where the stories originated. 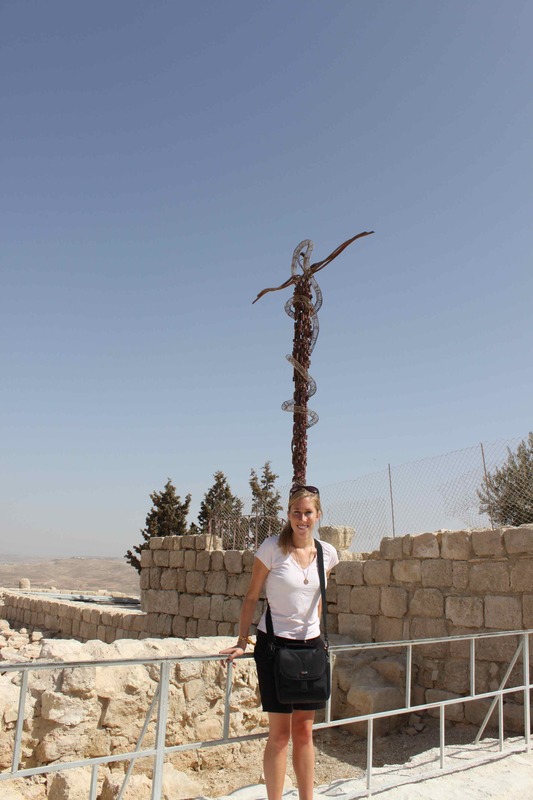 On top of Mount Nebo is the Serpentine Cross sculpture, which symbolizes the bronze serpent created by Moses in the wilderness. The Memorial Church of Moses is currently closed for renovations. However, the mosaics were removed and are viewable in a covered tent.